Classical Music Fireworks are the perfect mix of punctuation, drama and light. Some of the magic comes from knowing the right music to choose. Add a second skill of product knowledge with design, and you really do have a feast for your eyes. Sirotechnics Fireworks were approached by a client with a simple brief for the display (video below). We had a napkin with 3 tracks on it (overall 1 hour of classical music), and a budget. Our commission was to make a 10 minute classical music firework display. It sounds simple?! Classical Fireworks were one of the very first uses of music and fireworks together, when the proms in the parks started all those years ago. Still, each year, we see the beautiful harmony taking place between bands on the ground and fireworks over their heads in the balmy summer evenings across the UK. Sirotechnics are able to provide this Pyromuscial service at most locations, if you want us to quote for your summer concert fireworks, please do get in touch. What better way can you think of to end the proms in the park with your picnic?! For this finale, we provided silver fountain jets, airburst’s and confetti air bursts to shower the stage and front row on the last beat! Using the latest wireless digital firework technology, we can position effects to wow your audience almost anywhere! 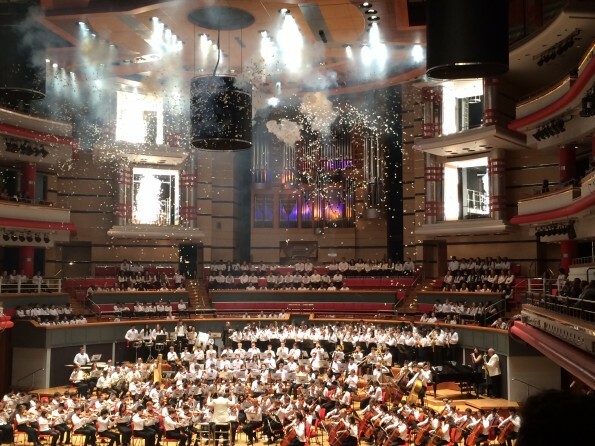 If you are looking to secure a Classical Music Fireworks display, then please get in touch, you may be surprised how affordable we are!